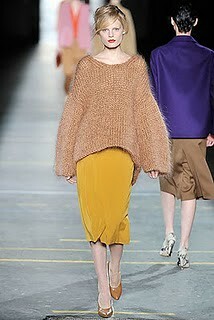 This fabulous Dries van Noten sweater from his 2009 collection, seriously has my heart skip a beat. 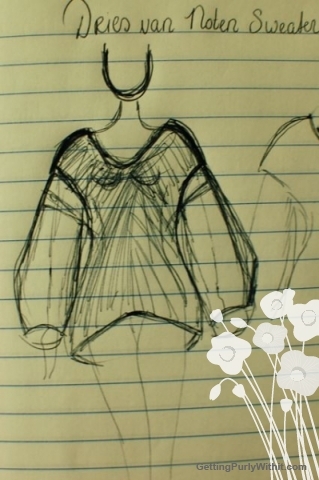 I saw this sweater for the very first time on the Jak and Jil blog and have been captivated ever since. It's big, it's chunky, it has a clean design and I just want to wrap it around me during a very viciously cold winter morning. As much as this sweater makes my heart skip a beat, it gives me a cardiac arrest after looking at its retail price: $1200.--. So what's a poor poor mortal like me to do? Give me two sticks and some yarn and I will get very resourceful! 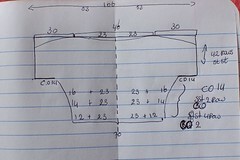 A quick sketch, some pondering about what style sweater this is, determining what gauge yarn to use and voila, this knitter is in full technical mode. Some chunky yarn, a large swatch, good amount of staring at the swatch and voila, this knitter is sweating the numbers. 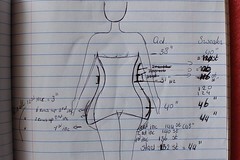 Scribbles of calculations everywhere, some more sketches... oh lordy, my head hurts. It is a lot of work, but I want that sweater so bad, it will keep me going. 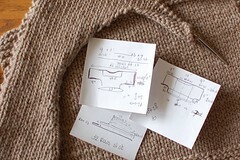 And lastly, I write out the instructions before I start knitting up this project. Before, I used to start knitting and just wing it, but nowadays I am more adamant of really getting into the calculations first. I have come to learn the hard way that just winging it is too time consuming and entails a lot of ripping out! Lately, I have come to notice that I don't look for inspiration in the handknitting world as much as I did before. Browsing through handknitting magazines, books and ravelry just doesn't captivate me as it used to do. 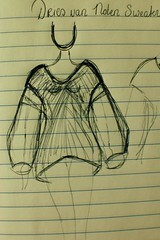 Instead I find myself browsing through sweater designs on the runway and I am having lots of fun doing so. Expect me to post about knitwear on the runway more and more. This complicated sweater is to me a work of art and I am in awe of the artful skills of the designer. Tip of the hat! i love seeing your process. Submitted by Anonymous on Mon, 08/09/2010 - 13:17.
i love seeing your process. this sweaters going to be a beauty! Submitted by Nancy Ricci on Mon, 08/09/2010 - 15:47. Submitted by JelliDonut on Sun, 08/08/2010 - 23:17. It's making me swoon! I want some yarn that exact color, but I haven't found it yet. Gorgeous! Submitted by Nancy Ricci on Sun, 08/08/2010 - 23:21. Me too, Susan... that red is simply gorgeous!